Mora knives are flashpoint in the knife community. A tenuous alliance between noobs, hipsters, and cheapsakes praise Moras for their out of box sharpness, great handles, and classic bushcraft features (square spines, scandi grinds, etc). Knife snobs and members of the Bark River Cult (a Venn diagram in which I am squarely in the overlapping section) remind people of the simple adage: you get what you pay for. Over the years I have reviewed a few Moras—the el cheapo basic Mora and a higher end, full tang number the Pathfinder. Both stunk. While the higher end knife was a full tang knife it still ran the dreaded rubber handles. After even moderate use the knife ended up looking like a puppy’s chew toy three weeks after you throw it away. Durability has never been Mora’s strong suit, or even their only-wear-it-twice-a-year-to-weddings-and-funerals suit. So when Mora contacted me again about reviewing the Garberg I was intrigued. In no small part my interest was piqued by the original Wirecutter article on fixed blades which found that the Garberg was the best choice for most people. I wrote a response to that article, which is found here. After that response the Wirecutter’s editor reached out to me (lil’ ole me? ), the article was pulled, and it was subsequently rewritten by Doug Mahoney (found here). Still, my criticisms didn’t necessarily focus on the Garberg and so its lofty position in the original article made me interested when a review sample floated my way. If this were the cliffhanger end of a season of television a voiceover would come and say: “Can Mora make a durable knife?” “What will happen when a Mora skeptic reviews their first completely reengineered design?” “Why doesn’t Mora tell us what kind of steel this is?” “How many snarky jokes will the review contain?” This of course notes an inverse correlation between snarky jokes and review score (the more snarky jokes, the worse the score: see Topo Designs Daypack review). The vast majority of the use and testing of the Garberg took place during the spring and early summer of 2018. During that time my two boys and I decided to build a lean-to in the field behind my house. It is slowly being reclaimed by nature and is wild enough that we can have fun back there and jackass around a bit without having long trip home. In the picture below the lean-to is in skeletal form, with a real mountain man walking back to its protective shelter totally shirtless. This is my little guy that always asks me: are we team knife buddies? Yep. Always will be, too. Every piece of the encampment from the lean-to to the wooden tools scattered about was made by the Garberg. It is a great way to test a knife even if this is more of a silly project than a survival scenario. And hey, it really entertains my little guys. Here is the product page. It costs $109. There are two versions--this one, the Garberg Carbon with a "high carbon blade" and the regular Garberg that runs a stainless steel blade. The Carbon is more expensive and came out AFTER the stainless version, which is different from how knives are usually released. There is no written review. Here is a video review. Here is a link where you can buy the Garberg (with benefits going to buy gear for review). Full disclosure: this review sample was provided by Mora. I am going to give it away. I don't keep review samples given to me. Twitter Review Summary: Finally, a Mora that real knife knuts can enjoy. The complaints of Mora detractors do not stem from a poor design, but rather lackluster implementation of that design. Given that, with upgraded materials and different construction choices, the overall knife is actually quite good. The “high carbon steel” (and yes I am going to use quotes for the entire review, see Steel below for the reason why) gives the scandi grind extra life, the full tang construction gives the knife a more solid feel, and the hard rubber handle takes strikes and hits from material much much better. In sum, the Garberg fixes about 75% of what ails a normal Mora. Fortunately, in doing so, the design does not throw out the stuff that makes cheap Moras appealing. The sharp spine is there. The neutral handle design is still present. The overall size and shape is quite good. Still, as if to prove to you that this Mora is different, there is an exposed rear pommel (which is not unheard of on Moras but is quite rare), demonstrating definitively that this is a full tang knife. In use I have come to really appreciate the exposed pommel. It smashed stuff quite well and allows for a strike point for blows used to drive the knife into material (which, admittedly, is not a common move). I like the exposed pommel so much that I would like to have one on every knife I have, not just the big choppers in my collection. Unlike the other Moras I have reviewed, this one has no production flaws. The handle is snuggly mated to the steel. The grinds are even and balanced. The sheath is snug and keeps the knife quiet. It doesn’t have the level of polish that a Bark River carries, but last I checked: 1) you can’t polish the rubber material on the handle; and 2) doing so does not make the knife better in use. Given the design and the materials, there is nothing lacking in terms of implementation. Ah, the universal “good feature” of all Moras—their handles. Make no mistake this simple handle is an ergonomic dream. And without the cheap material used elsewhere it lasts, too. Christopher Kimball, in Cook’s Illustrated (one of the many influences on this site), worte with passion about the benefits of a neutral handle design on knives. Donald Norman, author of The Design of Everyday Things (another influence), discussed design that allows for multiple uses. Here, this simple, subtle handle does just that. Nothing is more straightforward, less hotspot-generating, and pleasing when used than simplicity and the handle of the Garberg has simplicity in spades. Hovering at the perfect median between grippy and gushy, I have nothing bad to say here at all. This is one of three great handle designs out there (the other two being the Becker handle and the coke bottle design found on the Bravo I and many other Bark River knives). This handle reminds me a lot of the handle from the American Knife Company Forest, which was one of my favorite fixed blades ever. First, before we get to the actual steel, let’s clear the air—a knife company should never release a knife without telling you what kind of steel they used in the blade. Period. Full stop. Absolutely no exceptions. Ever. The rule of thumb is simple—if they don’t tell you, its because the steel stinks. I am not sure that hueristic applies here, but there is simply never any justification for glossing over the steel. “High carbon steel” is not good enough. Is this 1095, O1, or A2? Could be something exotic like 3V, W2, or Cru-Forge V? All are “high carbon steels,” but we simply don’t know. There are big differences between those six steels and a consumer has a right to know when the buy a knife what the steel is. The next time an executive at a knife company that omits steel designations goes to buy a car I hope the car dealer tells them that the car they are considering as “an engine” and gets “good gas mileage” without giving specifics. Its the same thing folks. We deserve better and Mora can do better. If Mora wants to make in-roads into a more profitable part of the knife market, which they clearly do, then they need to tell folks what kind of steel they are using. As for the steel itself, it has not been bad at all. My instincts tell me that this is either 1095 or O1. It has not held an edge as long as properly treated A2 and it has come short of something like 3V. Given the price and the designation, I think I am right, but because of Mora’s silly no steel listing in the specs decision, we are just guessing. In all, the steel held an edge fairly well, taking quite a beating, but as with many non-powder steels (and scandi grinds) once the edge started to go it went very quickly. This thing went from knife to ruler in the blink of an eye. 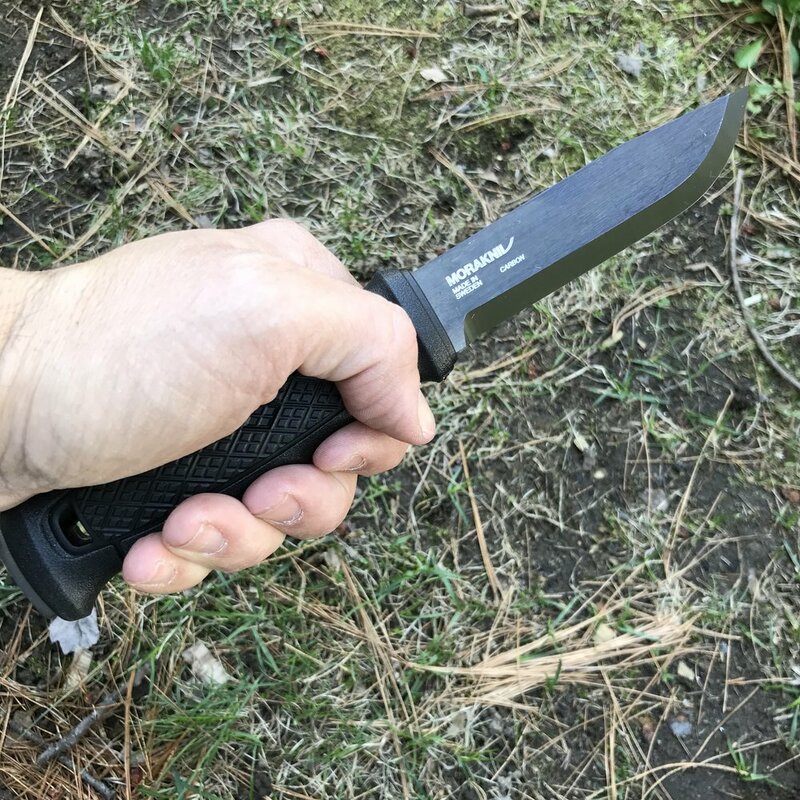 I was really beating on the steel, but I did nothing other than what it was designed to do—bushcrafty baloney—and it dropped its edge well before my Bark River Bravo 1 LT in 3V. First, just to get the taxonomy out of the way, this is a clip point blade. I mention that because the old fixed blade article on the Wirecutter, claimed that this was the best knife for most people and, at the same time, said that clip points were awful on fixed blades. Unlike that flawed article, I don’t have categorical stances on blade shapes. When done well, as here, any blade shape can work in just about any situation. I probably wouldn’t use a hawkbill to slice bread, but absent extremes, its the execution of the blade and not its shape that impacts performance. Here, the clip point works great. Remember that Venn diagram I mentioned? Well, given that, it is probably not hard for you to guess—I am not a fan of scandi grinds. Cedric and Ada has done a lot of work documenting steels and grinds and his findings match my experience—scandis are great for a bit and then become terrible. I did all of the wood work for the lean-to with just the factory edge. So while the knife was good at the outset, it eventually turned to a tool that no longer cut. Unlike with a convex grind or a hollow grind, it was a pretty binary event—sharp, then not sharp. That’s it. This leaves you with a blade needing a sharpening and despite what most scandi proponents say, this is not easy to do without specialized tools. Well, to be more precise, it is not easy to maintain a true scandi edge without specialized tools. If you have the time and skill, classic sharpening stones can give you a perfect scandi edge, but let’s look at all that entails. First, you have to have three grits of stones which are generally the size of bricks. So three bricks. Then you have to have a slurrying liquid, usually water. No big deal, but that does mean carrying around a bottle of water or using your drinking water while your in your moccasins bushcrafting. Then you need a truing device, something to make sure the sharpening stones are actually flat. If they aren’t the true scandi edge goes. Then you need some kind of finishing tool, a strop or the like, to kill the burr edge you likely develop. Finally, in addition to all that accoutremont you need to have the skill to free hand sharpen. Admittedly it is quite easy with a scandi grind—just register the entire cutting bevel on the stone and go, but there are still tricky parts, like around the ricasso and the belly of the blade. Of course you can field sharpen the knife with a flatish stone, but you lose the scandi geomtery and once gone it is essentially gone forever. I am going to try to sharpen this using a trio of glass plates, some different grades of sandpaper and some spray adhesive, and we will see. The point though, is this—scandis aren’t that easy to maintain. Gimme a good convex grind and a strop and I will be very happy for a very long time. There are two ways to carry the Garberg, first, as a traditional puuko style knife on a dangler-like belt loop (shown below) and on a pack using the multimount. The dangler style set up is, of course, comfortable and easy to use. The one drawback to carrying the knife this way is the fact that the belt loop itself is not fixed to the sheath. Instead the tube sheath slides down into a loop at the end of the dangler. It is a snug fit, but with some jostling and upward movement the tube sheath can come out. It happened to me more than once and usually occurred walking through thick undergrowth. I never actually had the knife fall out, but it seems at least theoretically possible. That is not good and worth a point off the score. The reason the set up is like this, however, is that tube sheath has to fit into the multi-mount, which is basically a MOLLE compatiable backing made of the same hard plastic used in the tube sheath. I attached the knife once like this and it did not move at all while on the pack. It is quite nice. However, given that most use will occur with the dangler loop, the effectiveness of the multi-mount is not great enough to make up for pop out problem. Its kind of weird. It looks really unattractive. 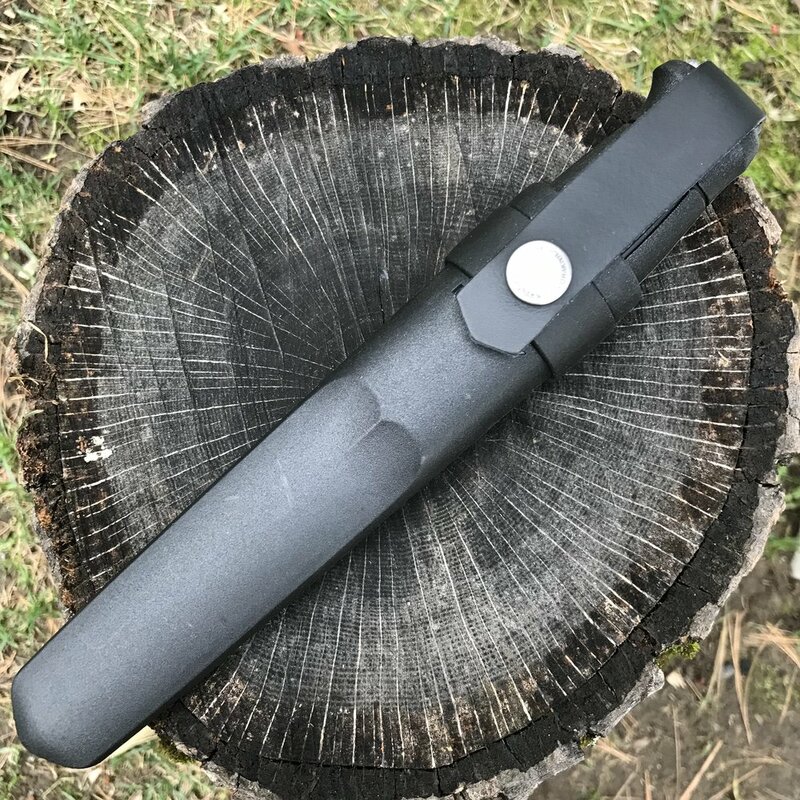 But the strap of rubber that just loops up over the pommel of the Garberg to hold it in the tube sheath is both very effective and allows for great accessibility. This is one-hand stow and one-hand retrieve knife. Its not exactly a blind stow, as the opening to the tube is pretty small, but it is a blind retrieve. Overall, like most good things about a Mora knife, this feature is fugly but effective. No knife is fatigue-free, but the Garberg is pretty close. Between a supremely neutral handle with zero hotspots and a balance that makes the knife feel weightless and responsive, it is hard to complain about this knife. There were a lot of hacking and chopping cuts when making the lean-to. There were also a bunch of long pull cuts to sharpen the ends of branches to make them easier to stab into the ground. None produced much in the way of fatigue. This is what all Moras do well and the Garberg doesn’t lose that in its transition to a nicer more robust design. And here is where most Moras react to evaluation like the front end of a car in NHSTA crash test. Fortunately, that’s no issue for the Garberg. With a better, more solid handle material, a bit thicker blade stock, full tang construction, and a “high carbon” steel, the Garberg works like a non-Mora and soaks up damage. I imagine that eventually the hard rubber handle with get chewed up right near the blade, but all fixed blades get that. For the hours and hours of cutting I did with this knife, it held up quite nicely. No question the Garberg Carbon is a very good knife. It is an excellent, all-around camp knife. It is a good size, with an excellent handle, and an innovative and decent sheath. The knife is slicey out of the box and the carbon steel holds a working edge for a while. It is not quite in the same league as other good knives, but it is certainly more than just competent. It is clearly and without question the best Mora I have ever reviewed or handled. In fact, if you like the Mora blueprint and want something a bit classier or more durable look no further. This is the step up Mora. The full tang construction makes the knife feel more durable and the tougher handle actually makes it more durable. But you still get that supremely great handle design that Moras should be famous for and that meh scandi grind that they are actually famous for. In the end, this is what happens when a Mora gets classy, like a rube in a tuxedo that surprisingly knows how to tango perfectly. Like guests at this would be, metaphor extending wedding, I was shocked at how good this blade is. Its not perfect and it is smidge below elite, but it is worth considering no matter your budget. If you want a good "serious" fixed blade, this is a perfectly reasonable purchase. Before I end the review I want to comment on something that Andrew Gene mentioned on GGL 104 (please listen, it was hilarious between Andrew’s blue humor and Nick’s outrageous puns). Moras are very comfortable and very ugly. Andrew called them the orthopedic shoes of knives. And really, that’s 100% spot on. I would never say that aesthetics should count in evaluating the performance of a tool, but there is something about a well made and beautiful fixed blade. The great Bob Loveless called it visual tension and the Bravo 1 has it in spades. It looks balanced and organic. It looks like something you want to pick up and hold. Moras look more like something you’d find at a one of those old people stores that sell canes and walkers—effective, comfortable, but homely. The Garberg is less blah than most Moras, but it is still one of the Lee children, I am just not sure if it is Ug-Lee or Home-Lee. Remember what I said about the Venn Diagram. This is me being a knife snob and I get that. But still, Moras are just ugly. And it doesn’t have to be that way—Helle makes some gorgeous knives in this style. Stepping up a $100-$125 gets you the vastly superior Bark River Bravo I LT in 3V (which now comes with a different sheath--maybe its better, can't be worse), but that’s not a fair comparison. Instead a survey of the $100 range of fixed blades shows that there are lot of good alternatives, the ESEE 4HM, the Ka Bar Becker BK16, the TOPS Knives BOB and slew of others. Even then, for the money this is decent. I haven't handled a lot of these knives, why bother if you have the Bravo I, but it might be worth exploring. Whatever else is out there, the Garberg is good enough that I know it will at least be competitive.